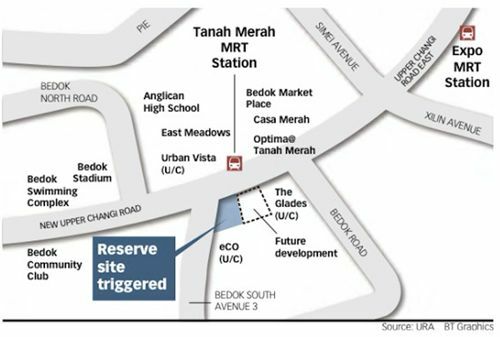 Just 3 weeks after the announcement of the 1H2016 Government Land Sales programme by the Ministry of National Development (MND), a bid has triggered the sale of a private residential site which is situated near the Tanah Merah MRT Station on the reserve list of MND. According to market watchers, this trigger bid has clearly reflect property developer’s eagerness to replenish their land banks. Due to the shortage of land supply for sale under the confirmed list, developers have little choice but to have a go at those under the reserve list. The triggered sale site has a total land area of 2.4 hectares, located at the corner of Bedok South Avenue 3 and New Upper Changi Road. This land parcel is expected is yield approximately 570 residential units in total. Although the Urban Redevelopment Authority (URA) did not disclose the identity of the developer who submitted the “trigger bid”, but it’s been mentioned that the bid committed was around S$320 million or S$580 per square foot per plot ratio (psf ppt). Based on statistics and sales figures for nearby new launch projects, the top bid has been forecasts to be around the range between S$600 to S$750 psf ppr. If that’s the case, the breakeven cost for the winning developer will be estimated from S$1,100 to S$1,200 psf. It noted that the last government land sale saw a top bid coming in at S$791 psf ppr in October 2012 when the property market was more buoyant. Thus, due to current market conditions, property developers are likely to stay cautious in their bids. Property analysts have said that due to developer’s depleting land bank, more sites under the reserve list may be triggered in the next couple of months. In addition, such competition for lands will likely help to keep prices more stable – despite a gloomy property market outlook expected. The tender for the plot will be launched by 22 January 2016.